I am seeking some help identifying a cox thimble drome model that is in my family. 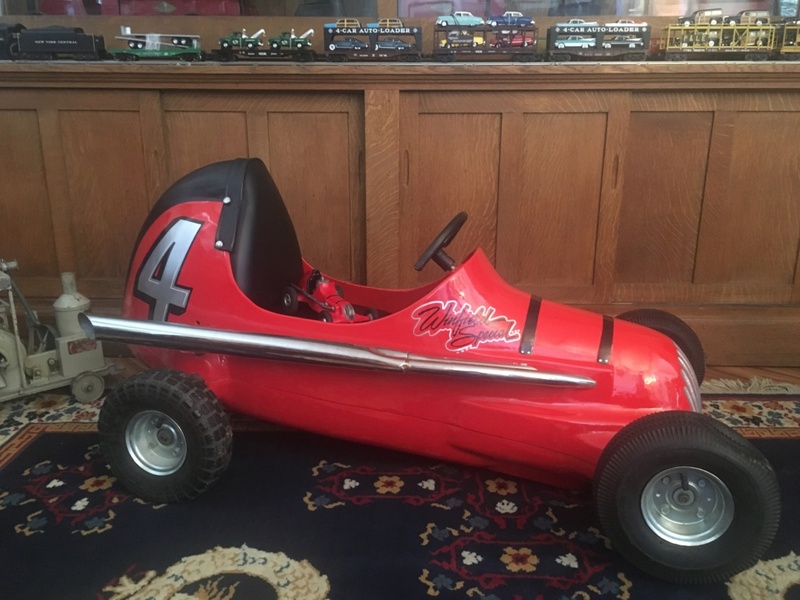 It is a two piece, cast aluminum body in the same midget style as the popular tether cars, but it is the size of a pedal car or possibly a children’s carnival ride. I sat a tether car on the seat for reference. Sorry I am of no real help, but just wanted to say that thing looks very nice! Interesting, looks like a ringer for the Roy Cox car. Is it marked Cox in any way? Thats correct- on the belly. Is it motorized? Trying to figure out why you have different tires front to back. To me it looks like a customization. Winfield Special brings up a man named Gene Winfield who is an automotive customizer. I believe the mismatched wheels are the result of an uneducated repair/restoration as they are obviously not original. Looks like a display for an event !! May be Mudhen will come by he would bee the one that may know . getback wrote: Looks like a display for an event !! May be Mudhen will come by he would bee the one that may know . I do know it wasn’t made by Cox. But its origin, like several Cox products, remains a mystery to me. Wouldn't "Thimble Drome" be a protected Trademark? rsv1cox wrote: Wouldn't "Thimble Drome" be a protected Trademark? That is what make me think Display for Races ?? Events , Thanks for dropping in Mudhen !! 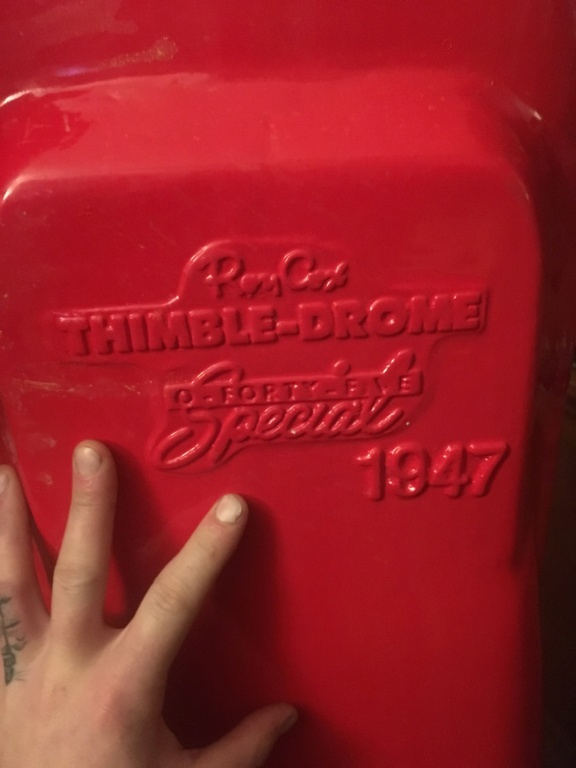 “Thimble Drome” wasn’t a protected trademark in those days. Keep in mind the era in which this took place. Whomever manufactured the car may have simply walked into the offices, shared their idea, got a big smile from Roy, (essentially approval,) and left. It’s free advertising for Cox. A win-win. When Bill Selzer designed the Riviera, he flew to Detroit, spoke with management, and was given a handshake for their approval. No contracts were ever drawn. Today, we live in an environment where people deliberately draw up lengthy contracts knowing that, “The party in the first, shall for the party in the second matter…”not, or can’t adhere to it. It came to us only half assembled and it was obvious to see why the previous owner gave up on it. Nice restoration. That item is indeed a rarity these days, first time I've seen it. For something that is 70+ years old, I'd say it is in remarkably clean shape, even with the mismatched front and rear wheels. Looks like hand truck wheels were used, may be able to fairly match up the front or back set to provide a representative showcase car. Quality is relative. Back then it was a child's peddlemobile or push car. They got hard usage by kids, and so sturdy was more important. Can't say, but could be that Leroy Cox contracted out the stampings then painted and assembled them in his factory. I read somewhere that to keep the production employees busy during times of idleness due to sales sagging during off flying seasons, that other model plane hobby manufacturing companies made other toys. One was the American Flyer sleds I believe. I remember the peddle cars of the early 1960's, I think one was patterned after the Ford Thunderbird convertible. They were of heavier gauge steel akin to automobile fenders back then. They were nicely painted in a simple scheme. 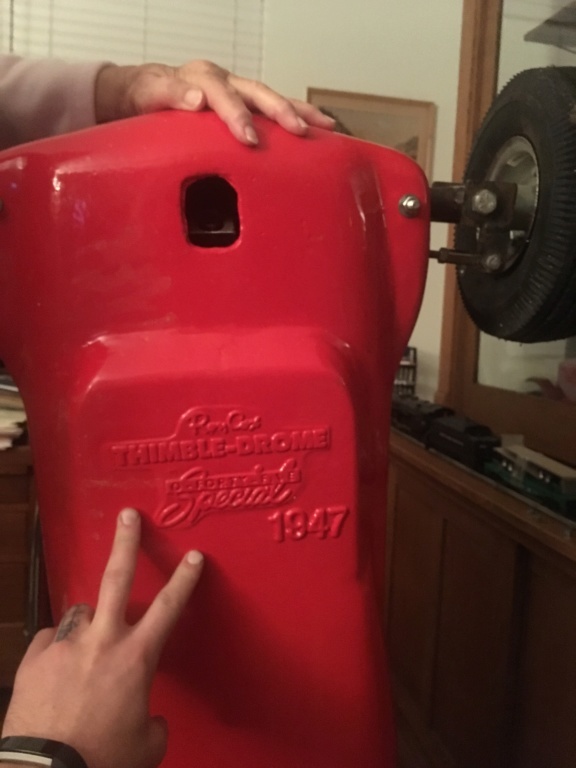 Parents kept them repaired, so a younger child would inherit his older brother's car, also passed between families, which by then had well worn tire treads, paint worn off in places, etc. Perhaps the absorbed lead paint from toys and vehicles prompted me toward a technical career years later? Actually the wheel/tires are not mismatched for a dirt track midget racer since the rear tires were always knobby for traction. The front tires were always straight tread for better steering and to keep from throwing mud clods into the drivers face. Paved track race cars would always have special no tread racing "slicks" on the front and rear to get as much rubber surface area for steering traction and forward motion traction. 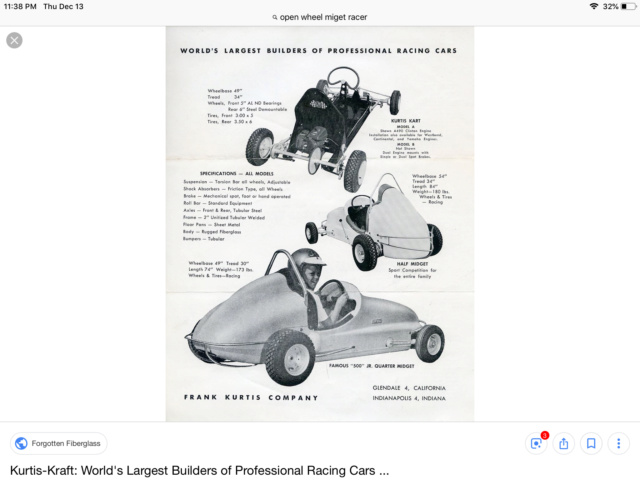 In 1947, virtually all midget racing was on dirt tracks, with a few famous exceptions, therefore the restoration is 100% correct IMHO. I helped crew an outlaw winged sprint car on weekends back in my crazy days around West Memphis , Arkansas in the mid 80's. I learned a lot about dirt racing and how not to get killed !!!! 66 Malibu wrote: Actually the wheel/tires are not mismatched for a dirt track midget racer since the rear tires were always knobby for traction. The front tires were always straight tread for better steering and to keep from throwing mud clods into the drivers face. Paved track race cars would always have special no tread racing "slicks" on the front and rear to get as much rubber surface area for steering traction and forward motion traction. In 1947, virtually all midget racing was on dirt tracks, with a few famous exceptions, therefore the restoration is 100% correct IMHO. Aren't they mismatched in that the front tires are larger diameter than the rear tires? 66 Malibu wrote: I helped crew an outlaw winged sprint car on weekends back in my crazy days around West Memphis , Arkansas in the mid 80's. I learned a lot about dirt racing and how not to get killed !!!! Good you got to experience something that many don't, helps with insight and perspective. Am more familiar with dirt track motorcycles than cars, back a couple years ago did flagging at events for the Christian Motorcyclists Association on motocross events. Was amazed by the amount of control exercised by the riders, how they could bunch up in corners yet have avoid entanglements. Cutest was watching the 5 - 6 YO's on their 50 cc dirt bikes. Some parents start them out young, considered them blessed. Though not often did come across a disrespectful teen who didn't like the flagging, was fortunate he wasn't banned from the race. A little reckless managing anger wrong, don't know what parents were teaching him, kid was on the wrong track. Good eye George …… The manufacturer was focused on building and selling kids toys. To be proportionally correct the left rear tire should be 2 times the size of the Right Front. The Right Rear tire should be 3 times the size of the right front and the Left Front tire should the 3/4 the size of the Right Front. There the proper tire stagger is fixed !! !